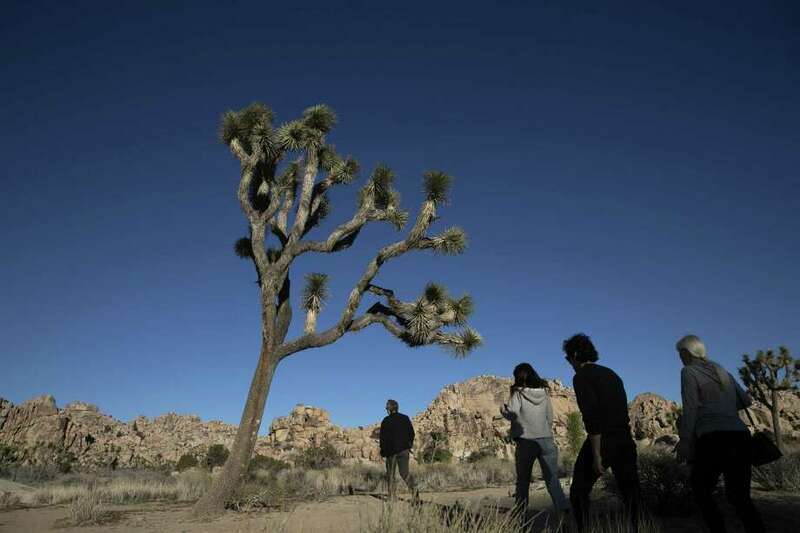 People visit Joshua Tree National Park in Southern California’s Mojave Desert on Thursday. STAMFORD — Community-beautification nonprofit Keep America Beautiful and Nestle Waters North America announced this week an initiative to help clean National Parks during the partial shutdown of the federal government. The project is launching on St. Simons Island, Ga., where KAB’s local affiliate has committed, with more than 40 new volunteers, to provide upkeep, including trash and recycling service, at Fort Frederica National Monument and the Bloody Marsh National Monument. KAB — which has some 600 local affiliates — is exploring providing similar assistance in other states, including California, Florida, South Carolina and Texas. A number of such efforts have emerged to aid the National Park Service — which is using visitor fees to keep open many of its most-popular sites since the shutdown started Dec. 22. But the agency cannot carry out regular operations because its employees have been furloughed during the shutdown. The staffing shortage leaves those destinations at risk of unchecked waste and unauthorized activities, such as visitors cutting down trees. “While our volunteers can't totally abate and remove the litter and debris that is amassing at our national parks and public lands during the government shutdown, our affiliates have offered their assistance in the communities they serve to support the parks during this time of need,” KAB’s Randy Hartmann, senior director of affiliate operations, said in a statement. Stamford-based Nestle Waters North America, whose products include Poland Spring water, announced an undisclosed amount of monetary donations and employee volunteers to support KAB. “Caring for our natural environment is fundamental to the work that we do every day, so we are proud to support the great work of Keep America Beautiful and to help play a part in ensuring these beautiful public places continue to be trash-free and protected,” John Caturano, NWNA’s senior manager of packaging and recycling programs, said in a statement. On its website, the NPS encourages supporters to give to the National Parks Foundation’s Parks Restoration Fund. Donations are intended to help the foundation work across the National Park system to assess needs and provide cleanup assistance once the parks resume regular operations after the shutdown ends. NPS also suggests signing up for volunteer programs to help rehabilitate its properties that it could oversee after its employees return to work. All parks were closed during previous federal government shutdowns in 2013 and 1995. The National Parks Service’s system covers more than 85 million acres, with 418 sites, according to agency data. Its 879 visitor centers and contact stations were visited by nearly 331 million in 2017. About 22,000 full-time, seasonal and temporary staff work for the NPS. Among other joint initiatives, KAB and Nestle Waters launched in 2017 a recycling education and awareness initiative for about 10,000 students affected by the water-poisoning crisis in Flint, Mich.
That same year, the two organizations partnered to increase access to recycling on beaches and in other recreational areas along Florida's waterways.